First, I spend a long time thinking about what a piece should do. Right now, for example, I’m working on my first piece for young band (Cheryl Floyd‘s group at Hill Country Middle School in Austin, Texas), and I’m trying to figure out how I can write a piece that’s playable without seeming trite or simplistic. I don’t want to write a total gimmick piece, or something that’s an arrangement of a folk song (are any of them left? ), or something where the wind players are expected to play percussion or something silly like that. Right now, I’m thinking I’d like to do something that’s rhythmically interesting, and I’m trying to figure out how to do that and make it straight-forward enough for young players but not so simple that it seems… lame. That’s the puzzle I’m trying to solve right now. Next up, I think about the motives I have, and I go out for a run. (I never think of anything good just staring at the computer.) I’ll “listen” in my head to that material as I exercise, and the material will loop and loop and loop, hopefully becoming more fleshed-out and longer as it loops. When I get home, I’ll jot down anything I can, although I don’t have perfect pitch, so sometimes I’m just writing down the shapes of the pitches but with the precise rhythms I want. Pitches tend to come last because that’s where I’m most likely to screw something up. I might have specific pitches in my head, but if I don’t “know” them well enough when I try to match them up with actual notes on a keyboard, I’ll get confused. It’s too easy for me to hear a real pitch on a keyboard — a pitch that wasn’t what I originally imagined — and think, oh, I think that’s it… or was it? And in that moment, I’ve lost what the original note was. My ear is just awful. I can think of material when I’m jogging — to me, interesting, complicated material — but in trying to figure out the actual notes, I often lose it. That means that frequently, in selecting pitches, I reverse-engineer it. I’ll end up initially with something watered-down from what I had in my head, then tweak it to make it sound more interesting again. The final version is probably somewhere between what I first imagined while jogging and what I am able to get down on paper (or into the computer). Okay — so now I have the overarching idea, the structure, motives, and hopefully at least the beginning of the specific notes. Then I set up a “short score” in Finale. I do very little on physical paper. I do write down the structure, and I jot down shapes of melodies and rhythms, but once I start putting a piece together, I need to use the computer because my piano skills are so poor that the computer is the only way I can hear what I’m writing. I’ll have Kontakt 2 running (Kontakt 3 doesn’t run so well on my system) with my long-ago programmed “Wind Ensemble Template,” and Finale is controlling Kontakt. In that template, channel 1 is piccolo with all sorts of different articulations — legato, staccato, sffz, 3-second crescendo, 1/2-step trills, full-step trills, flutter-tongue, etc. Channel 2 is flute with those same articulation options. Channel 3 is oboe, etc. There are two other sample channels that I rely on when writing the first short-score draft: percussion and… trombones. From the beginning, I know what I want the percussion and trombones to do. I’m not a composer who layers on percussion at the end (and they’re out there). Percussion is essential to the texture and drive of what I write, and it’s always been that way with my large ensemble pieces. Trombones, on the other hand, are the “meat” of the ensemble. So when I start writing a piece, if it’s a fast piece, it’s first scored for piano (lots and lots of pianos), percussion, and trombones. There’s a lot going on there, and that’s why I have to start with this short score — where all of the notes are there, but I don’t yet have to worry about what instrument will play those notes. I’m a slow orchestrator, so if I were trying to write this on a full score, I could spend hours on a single bar, and forget where I was going. 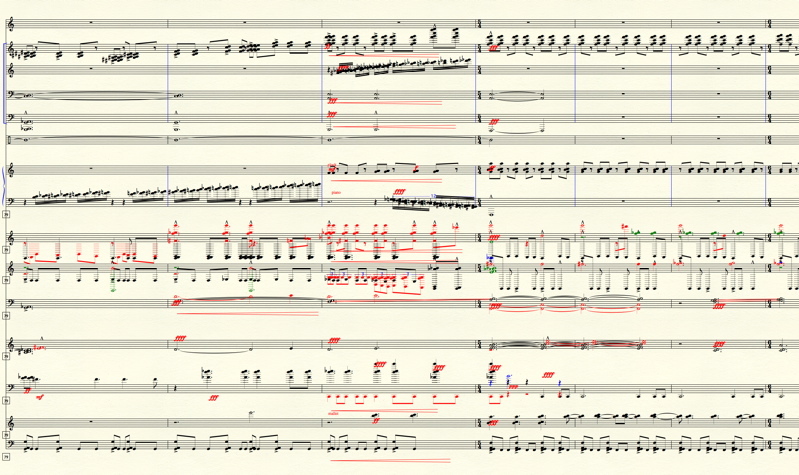 You’ll see that the short score is completely ugly looking, with ledger lines all over the place, extreme dynamics for the purpose of effective MIDI playback, missing rests, missing slurs, etc. But it all sounds, at least to me, essentially like “Turbine” would eventually sound. Well, if it had been scored for pianos, trombones, and percussion. After finishing the short score — and I know it’s done when I can listen to it and not know how to make any of it any better — I start the actual full orchestration. 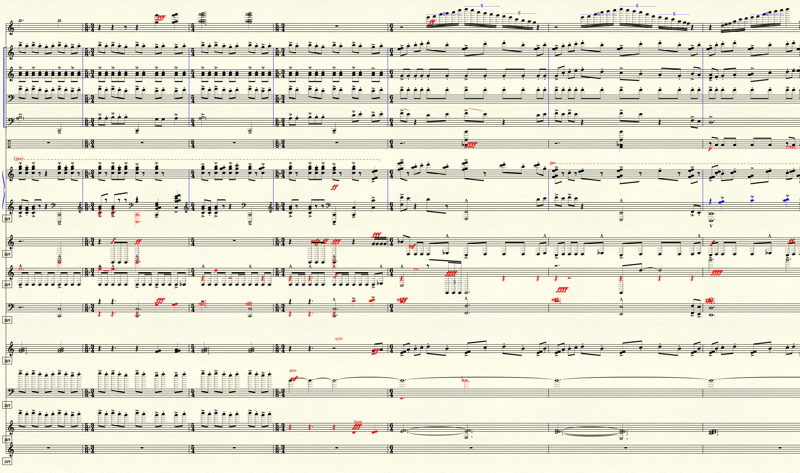 The orchestration process takes me about half as long as it does to write the short score in the first place. So that’s the general process. And I’m getting slower and slower, presumably because I’m getting more nit-picky. Every time I start a piece, it seems like I have to figure out how to write music all over again. I’ll start a piece a half-dozen or more times before I finally find material that’s worth developing into a full piece. “Turbine,” for example, has 53 versions. They’re not all completely different, of course, but there were 9 “false starts” before I figured out how to even start. Enough talk, though. Now I need to actually go write something. The middle school band piece calls. I wonder… Is 7/8 alternating with 4/4 too complicated for a good middle school band? I have the same problem with the ‘easily-lost’ pitches – the keyboard/piano can easily override the original internal sound shape and details. Was interesting to read you describe it – I know the feeling all too well. Fascinating all around – I like this post a lot. And no, 7/8 alternating with 4/4 is not too difficult – I think kids can handle all sorts of rhythmic complexity, as long as they all do it *together* – you get into trouble when you start having independent lines. My two cents. Really curious to see what you come up with! Give Abby our belated birthday wishes! John, this is great & very helpful – thanks so much!! I think 7/8 alternating w/ 4/4 is doable for this age group too – good luck w/ the new composition! Great post because a) it’s an interesting glimpse at your composition process, which I find fascinating because there are as many processes as there are composers, and b) it displays your devilish sense of humor (through your hyperlinks). Maybe I’m picking up on your stalker talents of following Corigliano around; you’re contagious! haha. I saw you at the USC Composition Forum a week ago when Corigliano talked about Circus Maximus, and one of my friends directed me to your site saying I had to check it out! Glad I did. Good stuff man! I can totally relate to the problem of not being able to translate what I hear in my head to paper. I usually get so bogged down in orchestration trying to recreate the musical texture I hear in my head that I loose sense of direction in the piece, just like you described. I love your idea of writing out all the different lines you hear in Finale having them patched with MIDI piano sounds. I am definitely going to give that a try! Nice setup and good write-up about the process. I am well impress in the sounds you use. I’m still very new at this (just finishing my bachelors) and haven’t purchased the VSL sounds. I’ve heard them, drooled over them – but don’t own them *sigh*. Anyway.. thanks for the write-up. Very interesting. Very interesting thread…I use Sonar (Cakewalk sequencer) to compose which substitutes for your step with the exaggerated dynamics, etc, then go back to Sibelius to orchestrate and generate a score if necessary. I say ‘if necessary’ because I do a lot of commercial music and often don’t need a score. I’m an EWQL http://www.soundsonline.com/home.php guy, but I’ve heard lovely things about VSL. 2. You no longer (in the photo at least) have a midi controller keyboard in your setup as you did in the NY photo. I’m looking at my controller and trying to remember the last time I used it. Something else that occurred to me as I read your thread was…why are students still compelled to take 3 semesters of piano to graduate? It’s no longer a necessary ‘go to’ for composers, and it’s clumsy for ear-training. While it has a great layout for theory visualization, I don’t think that justifies the time I spent practicing for proficiency class when I could have been catching up on…any number of things. I know more composers than not who use the method (or a similar one) you describe to write…so are we just subsidizing piano instructors? Is this necessary? Am I going to catch hell from the pianists reading this? I also think that thinking first, running, then returning is the way to go. Wow… I may only be a freshman, but I love composing. Even though the things i compose usually only turn out to be 30 measures and Its usually only for 3 or 4 instruments I love the idea of composing my own music. I really liked the part about “going for a run”. How you get the idea of what you’re going to write in your head and jot it down when you get home because thats something I use alot. Except its when im in geometry and bored out of my mind; ill take out a piece of notebook paper and make a generic staff and write down a few rythems (of course I can never get what I want on the paper because I have a hard time hearing what a note is). Ill get a few rhythems down and when I get home ill try and refine it on finale notepad. Ill definitely be bookmarking this page and coming back to it, I really like your compositions and your music is inspiring to me; I almost always have something you’ve composed playing on my computer. I really enjoyed that post. I’ve always wondered how people compose. I’m currently a transfer student at a community college, but am aspiring to be a composition and theory major thanks to composers such as yourself and Ticheli. I’ve played so many pieces by both of you fine composers and being able to know the process one of my favorites uses to create music really makes it much less nerve wrecking to think about making a career out of this profession. This is a really interesting insight into your method. It was also hilarious to read this old post with you talking about Undertow before you finished it. I played bass drum for it in my college band, actually, and it was pretty fun. I find myself humming little ditties in alternating 7/8 and 4/4 now. This post was really helpful for me…I’m a young composer (high school) so I’ve been trying out a lot of different processes lately for composing, this process really helped me fix a lot of my major problems (mostly the way the piece flows, and then I used to tend to jump from idea to idea randomly). Thank you! Do you have any general tips for composers? Man your weblog is far sexier than mine. Keep it up sir. Perhaps your readers will like my little web site, if they’re in the market for saxophones. I am a French Horn player in the A&M Consolidated Middle School Symphonic Cat Band, and I will say that we are playing Undertow and it is not hard at all for us. It is really fun. In my opinion, strange time signature systems are a good thing. I have even thought about writing something in 17/32. (Would be strange all right, but who cares) And, oh yeah, any advice for writing a symphony? I am 16 measures into one (that is over one month whenever my history teacher isn’t looking at me), and its very strange (theremin part). I appreciate how you write for contrabass clarient, as everybody always leaves those out. It’s exciting to me to hear about your process, and to see the way you have your studio set up. I’m a Sibelius user myself, and although I’ve played with Finale a few times, I really have a hard time getting it to do what I want it to do. I’m also fortunate in that at my school district I have access to a Yamaha MM8 keyboard and they also gave me a copy of Cubase 4AI, which I am slowly learning more about. Eventually I hope to be able to compose more efficiently using tools like this. Thank God for Youtube tutorials! Thanks for sharing your process with us, John! About how much did this entire set-up cost, and what are the benefits of using Kontakt with Finale versus being like me and doing everything on Finale 2011? Thanks so much Mr.Mackey for giving this very great look into your writing process.Also Undertow is a great piece…love the 7/8 4/4 feel. There are so few composers who appreciate strange, STRANGE time signatures. I know Hans Zimmer also appreciates 7/8… but no one truly understands the concept that music is actually ALLOWED to represent the insanity of life like you do. I read the blog, and I read where you were talking about a piece in 4/4 and 7/8, and thought that sounded familiar. Then I looked at my timpani parts for symphonic band this semester and realized you DID mean Undertow! One of the most fun timpani parts I’ve gotten to play. Hats off to you, Mr. Mackey.